The Nashville/Midsouth Chapter of The National Academy of Television Arts and Sciences (NATAS) announced their nominations for the 26th Annual Midsouth Regional EMMY® Awards at a November 18th reception held at BMI’s Nashville headquarters. This is Common Sense Films’ and Mr. Hill’s third Midsouth Regional Emmy nomination. In 2008, the team was nominated for the feature documentary The Fort Fisher Hermit in the category of Best Documentary/Historical at the 22nd Annual Midsouth Regional EMMY® Awards. Rob Hill was also nominated for The Rising Star Award in the same year. 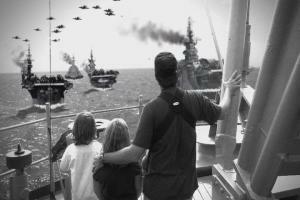 Battleship North Carolina: The Showboat Legacy had a May 29, 2011 broadcast premier on UNC-TV. This enlightening documentary explores the history behind this decorated Naval vessel and the monumental task of maintaining it as a National Historic Landmark. The past and present merge as this half-hour program highlights the USS North Carolina’s history and her legacy that continues today. The Chicago/Midwest Chapter, the Mid-America Chapter based in St. Louis, judged more than 700 entries the Mid-Atlantic Chapter based in Philadelphia, and the New York Chapter resulting in nominations for 65 organizations. Winners will be announced during a live awards ceremony to be telecast from the Schermerhorn Symphony Center in Nashville, Tennessee on March 17, 2012. To learn more about Battleship North Carolina: The Showboat Legacy you may visit www.showboatlegacy.com. The 17th annual Cucalorus Film Festival came to a close on Sunday night, capping off a record year for the events overall attendance and marking the debut of the NC Retrospective program. The festival hosted 297 artists, including filmmakers, dancers, choreographers, poets, musicians, actors, and one mime from 7 different countries around the world and from cities scattered across the country. Accumulated attendance at the festival’s screenings, parties and educational events totaled 10,515. Cucalorus 17 presented seven films as part of their more mainstream Magnolia program – films that had already received widespread recognition on the festival circuit. Audience buzz centered around Vikram Ghandi’s doc Kumaré – with rumors about the future of the film spreading throughout the festival. Erica Dunton’s feature to.get.her was the clear hometown favorite, featuring a question and answer session that filled the stage at Thalian Hall with dozens of cast and crew. Cucalorus continued its UK Spotlight program, highlighted by a sold-out screening of Lynne Ramsay’s We Need to Talk About Kevin featuring a tour-de-force performance from Tilda Swinton. British filmmaker Matt Hulse returned to the festival for an intimate presentation about a collaborative community based documentary project with Roll Out, Cowboy (CFF 2010) director Elizabeth Lawrence. The organization will hold its annual festival fundraiser “An Evening at the Oscars” next year on Sunday, February 26, 2012 featuring a live broadcast of the Oscar ceremony. Tickets for the event went on sale today.